10 -16 November 2013 marks Spinal Injuries Awareness week. 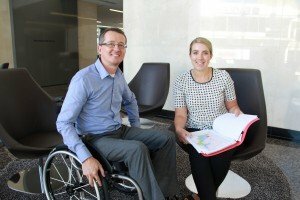 Last week, Shine Lawyers’ solicitors Will Barsby and Peter Matus took part in the 2013 Spinal Injuries Association Take My Seat challenge. During the challenge, the men spent a morning in a wheelchair and carried out daily tasks such as using an ATM, ordering a coffee, catching a bus and navigating the streets. The event was established to highlight accessibility issues in local communities and aims to give participants an insight into the daily challenges faced by wheelchair users. After assisting many clients who use wheelchairs, Will and Peter were inspired to take part in the challenge to raise money and awareness to support the association. Peter undertook the challenge on the Gold Coast on November 6 and said one of the highlights from his day was meeting the inspiring team at the Spinal Injuries Association. 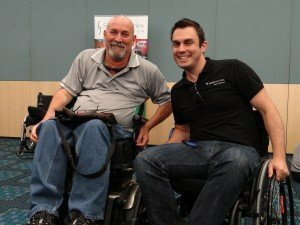 “It was interesting to see Brisbane through the eyes of a person in a wheelchair,” said Will who took on the challenge in Brisbane on Friday 8 November. Take My Seat and Spinal Injuries Awareness month take place in November each year. For further information you can visit the Spinal Injuries Association website at http://www.spinal.com.au/. Written by Shine Lawyers on November 18, 2013. Last modified: September 26, 2018.